Congratulations to Holly Mitchell on winning our twenty fourth High Five Giveaway and thank you to all who entered! We had more entries than ever! 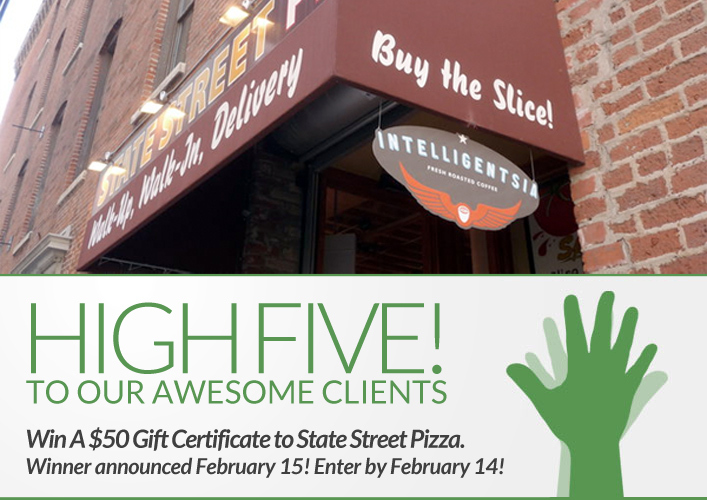 Our next High Five Giveaway is for a $50 gift certificate to State Street Pizza. Order your favorite pizza, pasta, salad, wings, subs, and more with State Street Pizza located at 400 N State Street, Chicago, IL 60654. State Street Pizza has always given the people of Chicago quality food, fast delivery, and great customer service… all at a palatable price. Our pizza, pasta, and meats are prepared freshly daily in our kitchens — and that’s our guarantee. Visit their website at www.statestreetpizzachicago.com or call them at 312-624-8270 for more information. What decade are Spring styles heavily influenced by? Now, just add a comment to this post with the right answer to be eligible to win! The winner will be announced on Friday, February 15. Entries must be received by midnight on Thursday, February 14. Good luck! bold colors & The 70′s! The 70’s sort of scary! Looks like we’re back to the 70’s.